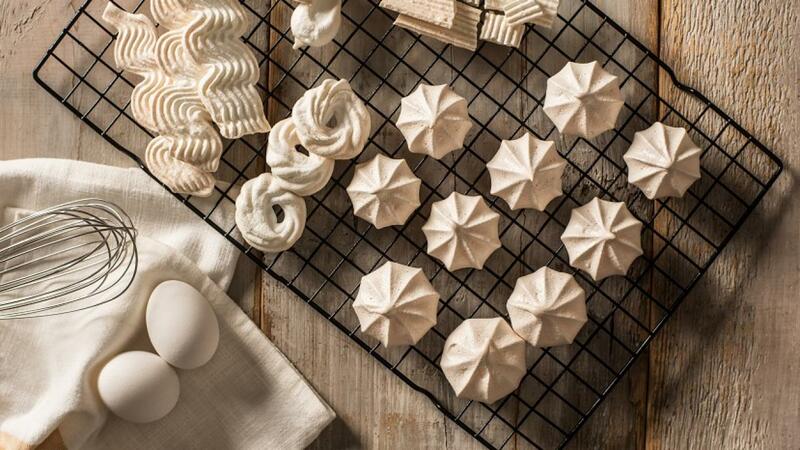 Hard meringues are a delicious airy dessert, with many variations. It’s quick to make and only requires a few ingredients. Remember, egg whites beat best if at room temperature. Preheat oven to 275°F (140°C). Line baking sheet with parchment paper or spray with cooking spray. Beat egg whites in large bowl with electric mixer until frothy. Add cream of tartar and beat until soft peaks form. Gradually beat in sugar, 1 to 2 tbsp (15 to 30 mL) at a time, until sugar is dissolved and stiff glossy peaks form. Beat in vanilla. 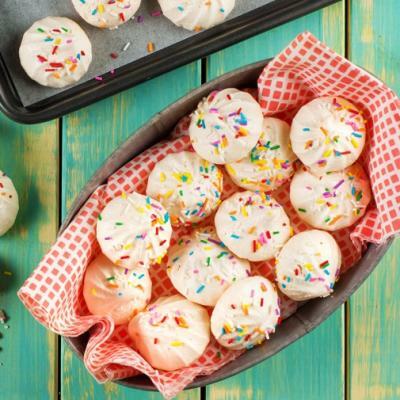 To make Meringue Kisses, pipe or dollop about 2 tbsp (30 mL) meringue per cooking on baking sheet. Bake in preheated 275°F (140°C) oven until firm, about 30 to 35 minutes. Cool completely on wire racks. 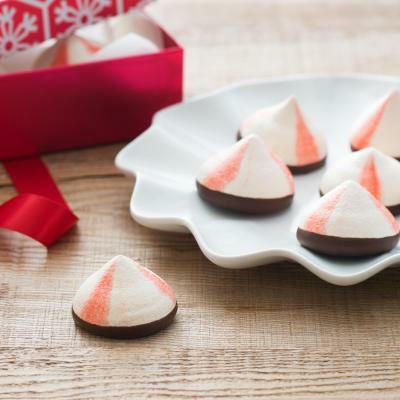 1) Flavoured Meringue Kisses—try making Chocolate or ChocolateToffee Nut Meringue Kisses (see recipes on eggs.ca). 2) Large Meringue Kisses: Spoon about 1/2 cup (125 mL) meringue on a prepared baking sheet. 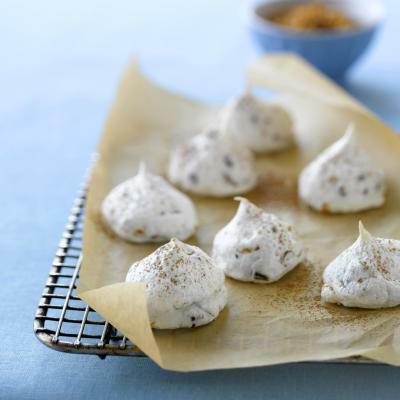 Pull meringue into a peak resembling a large chocolate kiss using your hands. Smooth the sides. Repeat with remaining meringue. Bake until meringues are firm, about 45 minutes. Cool completely on wire racks. Makes 8 large meringues. 3) Meringue shells: Draw ten 4-inch (10 cm) circles on parchment and paper; place paper upside-down on a baking sheet. Spoon 1/3 cup (75 mL) meringue on each circle. Spread meringue with spoon to form shells, making sides higher than centres. Bake until firm, about 45 minutes. Cool completely on wire racks. Makes 10 to 12 shells. 4) Pavlova shell: Draw a 10-inch (25 cm) circle on parchment paper; place paper upside-down on a baking sheet. Spoon meringue onto circle. Spread with a spoon, forming a shell and making side higher than centre. Bake until firm, about 1-1/4 hours. Turn oven off; leave meringue in oven for 4 hours with door closed. Instead of cream of tartar, use lemon juice. Separate eggs while still cold. Be sure no yolk slips in with the egg when separating the eggs. Yolk contain fat; any fat in with the whites will prevent the whites from beating to a good volume. Let egg whites stand at room temperature for about 20 minutes after separating. They will whip to a greater volume than if beaten when cold. Use a glass or metal bowl; plastic bowls can have a greasy film which will prevent the eggs from beating to a good volume. Check whether sugar is dissolved by rubbing a little of the beaten meringue between your thumb and forefinger. If it feels gritty, beat a little longer.